Because of the strongly related socio-economic impacts, upwelling has been selected as a major focus in the newly formulated IIOE2 Science Plan. In particular, the WIO contains a rich diversity of geophysical mechanisms that induce upwelling and make this region so different from the EIO, and in fact unique worldwide. This is largely due to the interaction of wind (especially the monsoon), currents, eddies and Coriolis force with unique coastlines and topogographic features such as the landmass of Madagascar, the Mascarene Plateau, seamounts and ridges � all to produce great contrast in the size, intensity and seasonality of upwelling between the eastern and western parts of the basin, as well as between the north, southern and central WIO. Two complementary, regionally unifying, projects have therefore been set up to study upwelling and its influence on the dependant ecosystems. The projects are referred to as the Western- and Eastern Indian Ocean Upwelling Research Initiatives respectively (i.e., WIOURI and EIOURI). The varying forms of upwelling in the WIO have been distinguished into 9 systems � referred to as regional "upwelling" projects (RUPs) in WIOURI. 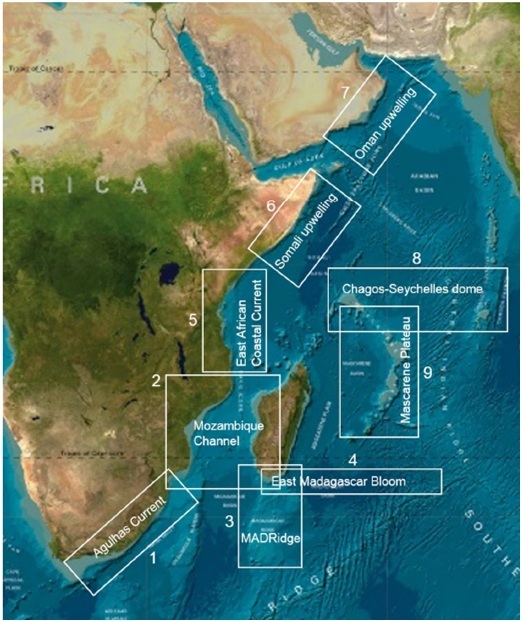 These include: (1) Agulhas Current driven upwelling, (2) Upwelling in the Mozambique Channel, (3) Madagascar Ridge and seamounts upwelling, (4) Southeast Madagascar shelf and SICC chlorophyll bloom, (5) Upwelling in the East African Coastal Current (EACC) and influence of major islands (Mafia, Zanzibar, Pemba), (6) Upwelling Somalia Current system, (7) Oman/Arabian Sea upwelling system, (8) Chagos-Seychelles upwelling dome and Chagos Ridge, and (9) Mascarene Plateau induced upwelling. WIOURI is designed to have at least two cruises per RUP and for the data collection phase to run between 2016 and 2021. It aims to leave several legacies in the form of research centres, schools, and scientific outputs.